Becoming a parent means you have so much to teach a little person. I know, for me, at times it can be overwhelming the amount of knowledge and manners I am trying to install on my daughter. When it came time to introduce religion into my daughter’s life I was not sure where to start. We don’t belong to a church. I moved when Peyton was 1-year-old and was completely overwhelmed with being a single parent, working and trying to figure it all out that I quit going to church. Well, now Peyton’s older and she asks questions about God. 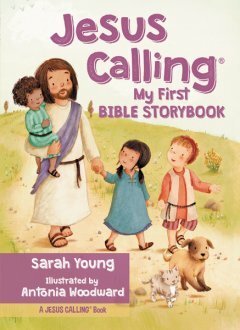 Jesus Calling My First Bible Storybook is a great way to introduce children to the stories of the bible. Jesus Calling My First Bible Storybook has thicker pages similar to a board book but not as thick. It’s perfect for little hand to turn the pages without ripping the pages. Each story has colorful and detailed illustrations bring the bible story to life. Each story is a page or two long, with illustrations helping to explain the story and a line from Jesus’s perspective. By the end of the book, your child will feel like Jesus is warm and loving, looking out for them and only wanting the best for them. I feel this is a wonderful way to encourage your child to take an interest in religion. You can find Jesus Calling My First Bible Storybook on Amazon or your local bookstore.